With our active Instagram account, we have received many inquiries regarding dog acupuncture. Here is the story behind our wonderful journey into TCM and pets. I am an avid alternative health advocate, seeking ways to improve my health without Western drugs. It wasn’t until about 10 years ago that my stress really manifested itself into my neck and back. I remember the morning when I couldn’t get out of bed, because the strain on my neck-shoulder area was this stabbing relentless pain! OMG! After 10 years of human satisfaction, I realized that my aging baby had some stiffness in his hips. Hambone had a bit of trouble running down the the path on his way to poop in his spot. So, I decided to book him an appointment at El Segundo Animal Hospital. Now, this was in early October 2016, right before he injured his back in the worst way possible. Since I am a pro at acupuncture treatment, with my 3 years of visits, I was able to judge his session with confidence. Basically, his time with Dr Chesel was pretty darn pawsome! A full hour with stimulation and aquapuncture of B12 in his little hips! Super!!! And the doctor was super empathetic and very gentle with Hambone. I did note that she identified that he may have some disc issues in his mid back. Upon bringing Hambone home, he was energetic and even went down the stairs on his own. I was super excited. I would like to attribute his improvement to the needles; however, the treatment was suddenly stopped. 2 weeks later, he fell and injured his back, incurring major back surgery for three herniated discs. The most intense situation I have experienced as a pet owner was also a blessing in disguise. Prior to his accident, I was not about to put him through back surgery, due to all the negative press about it. He really screwed up his back, we rushed him to surgery and then off to the races in recovery! With that behind us, I decided to take him to rehabilitation for dog acupuncture and physical therapy. As highly recommended by our trusted vet, Dr Streiber, we enrolled in Beach Animal Rehabilitation Center, in Torrance CA. In addition to acupuncture, BARC provides hydro treadmill, electro-wave therapy and rehabilitation sessions. Visit Beach Animal Rehab Center in Torrance! 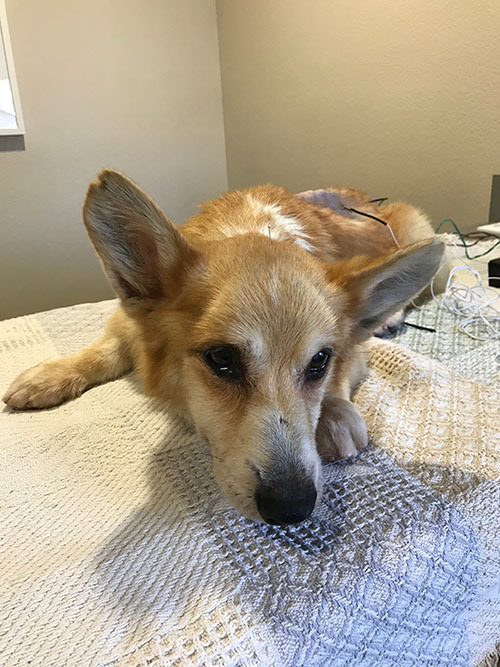 Today, Hambone continues acupuncture and rehabilitation. I truly believe that these treatments have many benefits. He will never be as good as he was, and at 17 years old, his maintenance is the most important thing to us. Here are photos from a couple of his treatments! He kinda loves them! Addendum: Our beloved Hambone passed well after this article was written. However, we spent a year of treatment at BARC, under the care of Dr Amy Kramer and Dr Deborah Volgaris. Acupuncture is amazing. I truly believe that it provided healing and energy boosts for Hambone. In addition, he was showing great improvement in mobility! I will be writing another article on all of his treatments throughout his rehabilitation.